Thoughts on my finished brewery. 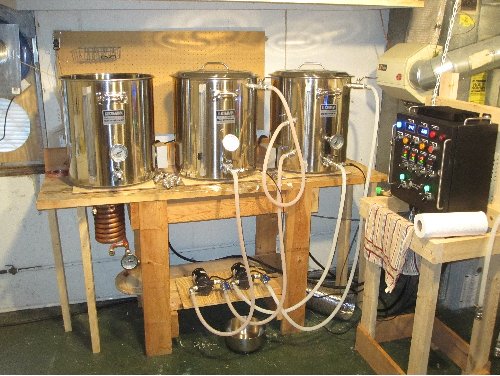 Link Posted: Tue Nov 15, 2011 5:12 pm Post subject: Thoughts on my finished brewery. This is nothing more than some rambling...I just wanted to share my excitement for having a completed, single tier electric brewing system in my basement, and thank Kal and Mike for a extremely informative website, and their corresponding products. My system is 95% a clone of Kal's. After deciding I was going to take the plunge on an electric system, I stumbled upon theelectribrewery.com. Kal's design basically matched what I was planning, except it was designed far better. After realizing his CP design was superior, and then later realizing I did not have the time, or want to spend the time building my own (thanks to real work), I decided to order a built control panel, heating elements, power cord and HERMS coil from Kal and Mike. The build quality of all the products is top notch. The heating elements were easy to install and work great. The control panel is beautiful, and also works great. Part of my job is auditing the design of electronic controls, and Mike's work looks better than a lot of the things I see at my job. It really is as nice as it looks in the pictures. The HERMS coil also works great, and is "shaped" better than anything I could of attempted. In addition to their products, Kal and Mike's customer support was outstanding. I'm paranoid (especially when it comes to brewing), and can be somewhat dense at times when it comes to mechanical items. (Just scroll through recent threads and you'll see all the dumb posts I've started). Kal and Mike were always quick to respond to my questions, even if the answers were obvious or on some part of the website that I was too lazy to read through. Now all I can think about is brewing. I've run three 5-gal batches on my system, and while none of them are completely finished (should be kegging batch #1 on friday), the initial tasting samples taste significantly better than what I was producing on my old setup. The system is a joy to brew on. I feel like I'm in complete control of the process, instead of making calculated guesses and feeling lucky if I hit all my numbers on my old system. I'm still getting used to the clean up process, but for the most part, the brewing process is smoother, quicker, and just a lot of fun. I know this thread is useless with out pics, and I apologize for not having any at this moment. I'll try to snap a few tonight and post them up here. Anyway, Thanks Kal and Mike, you've definitely helped to grow "the obsession". Glad you're enjoying the setup and thanks for the kind words! Ok, here is a picture of the setup. I didn't bother with any close ups, because as I said, I followed Kal's design. Sorry for the quality... not really a photographer. Congrats and thanks for the business! Official manufacturer for TheElectricBrewery.com. Click here to order our products! Thanks guys. I guess I could explain a few things... The table was an existing table that I modified (you see the legs I added). The front leg on the left side had to be moved to the right some to allow the clothes dryer door to be able to fully open. I had to build a stand for the control panel, because as you can tell, the furnace is right there. The room is pretty small, so I had to make some tweaks. There is an exhaust hood, I just didn't get it in the picture. It works great. You can't even really smell it when I'm brewing, unless you go outside!